How has construction output been affected by the EU referendum? Home All Articles How has construction output been affected by the EU referendum? Recent figures from the Office for National Statistics (ONS) show a decline in construction output. Here, we take a look at what effect the EU referendum has had on this and how the industry expects the decline in output to affect employment. One encouraging piece of information came in the knowledge that in the second quarter of 2016, there was an 8.6% growth in new construction orders. This was driven mostly by housing. The Office for National Statistics (ONS) released its latest round of construction output figures in August and September. The results have certainly given the construction industry something to think about. Covering the output between April and July, there have been decreases in comparison to earlier in the year and from the same point last year. Between April and June (Q2), construction output decreased by 0.7% from the levels experienced between January and March (Q1). It represented a 1.4% fall from Q2 2015 as well. In addition, the output registered in June 2016 was 0.6% lower than the corresponding output from May 2016. Breaking down the quarterly numbers a little further, an overall 0.8% decrease in new work occurred because both total new housing (1.1%) and infrastructure (3.7%) decreased in the Q2. For the latter, it was the third successive quarterly decrease. Added to this, there was a 0.5% decrease in repair and maintenance (R&M) output between April and June, with a 1.8% drop in housing R&M the chief contributor. Many house builders - both big and small - are reporting that things have actually changed very little since the referendum, and that demand for new homes remains buoyant. The figures relating to output in July 2016 are a little better, with a flat rate recorded when compared to June 2016. This is after a 0.9% decrease from May to June. All new work increased by 0.5% in July, while all R&M brought about a 1.1% fall. It means that output is down by 1.5% when set against the corresponding month last year. The report's statistics show a monthly fall in total new housing, but a 5.6% increase compared with July 2015. Between June and July though, both public and private new housing decreased. The underlying pattern from recent ONS releases suggests that between each three-monthly cycle, construction output is decreasing by 1.2%. 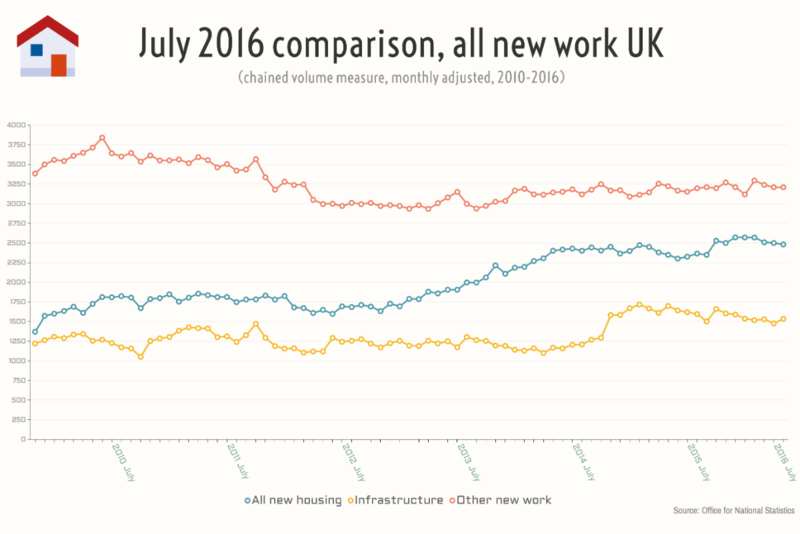 Indeed, in July, of all the areas of work, only public other new work and infrastructure contributed increases in output. However, one encouraging piece of information came in the knowledge that in the second quarter of 2016, there was an 8.6% growth in new construction orders. This was driven mostly by housing. One line in the report that stood out concerned the EU referendum, which has been and continues to be a source of much debate. We've reported previously about the effects of Brexit and how organisations should prepare. Interestingly though, the ONS report states "there is very little anecdotal evidence at present to suggest that the referendum has had an impact on output." Granted, with the data in this ONS release running until the end of June, there hasn't been much time to feel any impending effects of the decision to vote leave. However, there was plenty of uncertainty beforehand. Despite this, the Federation of Master Builders (FMB) - the UK's largest trade association in the construction industry - told us that house builders have seen little change since the referendum, which suggests that the fall in output is not related to the referendum. While numerous people have suggested that Brexit presents challenges to the construction industry, the idea is actually a bit of a red herring and we've seen little change since the result. An FMB spokesperson said: "Undoubtedly, the results that measured the construction sector's health immediately preceding and following the vote looked disastrous. However, many house builders - both big and small - are reporting that things have actually changed very little since the referendum, and that demand for new homes remains buoyant." This feeling was backed by Paul Payne, Managing Director of One Way, a construction and rail recruitment company, said this only caused "some natural hesitation." He said: "While numerous people have suggested that Brexit presents challenges to the construction industry, the idea is actually a bit of a red herring and we've seen little change since the result, except for some natural hesitation brought on by the 'Armageddon scenarios' being pumped into the market. "We're as busy now as we were before the referendum." There isn't agreement across the board for this opinion though, as demonstrated by Max Robinson, who owns Ace Work Gear - a business that sells construction safety equipment and workwear. He believes the referendum has taken on an 'immense role' in the decrease in output. He said: "There has been a clear decline since the start of the year, but it became considerably worse for all sections in the construction industry (apart from public housebuilding, but even there we've noticed a slowdown), in June of this year." We have not experienced any effect on jobs to date. We have a concern that future projects may not be commissioned due to funding but at this stage we have no evidence to suggest that this is happening. What does the output decline mean for the industry? Well it's worth noting that output is defined as the amount charged by construction companies to customers for value of work, excluding VAT and payments to subcontractors. It stands to reason that if companies aren't making as much money from their customers, there may be cuts elsewhere. Could this output therefore, have an impact on construction jobs? We spoke to the industry to find out. To some, it seems as though the impact is yet to be felt. Simon Connington is the Managing Director of BPS World - a global resourcing partnership that is focused on attraction, engagement and retention of talent. Simon says that the reduction in construction output hasn't affected jobs as of yet. He still has concerns, if not evidence, that such a drop in output could be harmful to future projects. "We have not experienced any effect on jobs to date. We have a concern that future projects may not be commissioned due to funding but at this stage we have no evidence to suggest that this is happening." 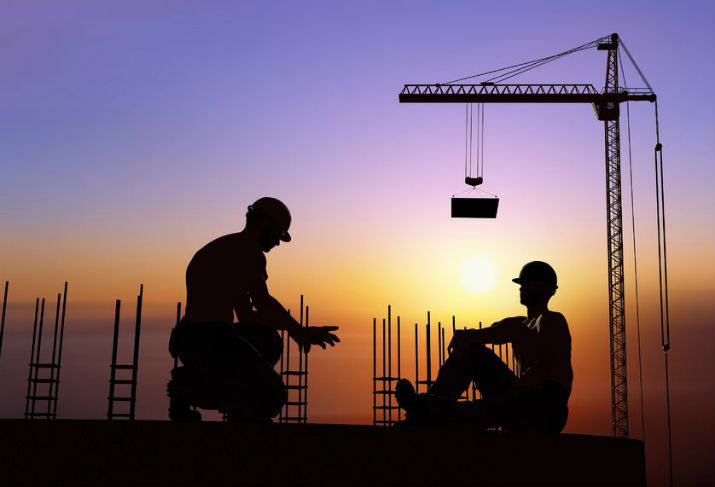 The FMB believe that the decline in output isn't a major concern to construction. What is more pressing is "the mismatch between supply and demand for skilled tradespeople." Their spokesperson said this is especially the case given how important house building is to the industry. "Shortages in key trades such as bricklaying and joinery have been obvious for years now, and barring a serious sector contraction, these are likely to continue for the foreseeable future."